Following on from the great success of the previous three November weekend Chenrezik retreats at Poulstone Court, we have booked this delightful venue in rural Herefordshire once again for the weekend of Friday 22nd to Sunday 24th November 2019 for our fourth residential weekend Chenrezik retreat. 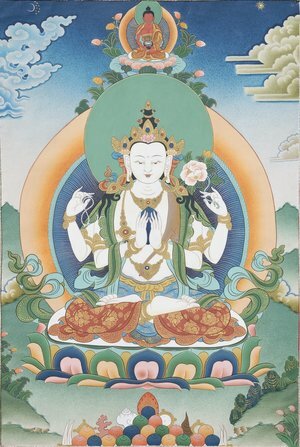 The retreat is open to Dechen sangha members and students of Lama Jampa Thaye. We highly recommend you to attend if you are a new Chenrezik practitioner to help familiarise yourself with the practice, and seasoned practitioners are also very welcome, as we can all benefit from practising together in a group setting in this very favourable environment. Poulstone Court is a large Victorian house in rural Herefordshire, about an hour and a quarter’s drive from Bristol. 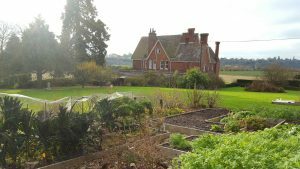 Facilities there include a spacious meditation room with large windows and extensive rural views. 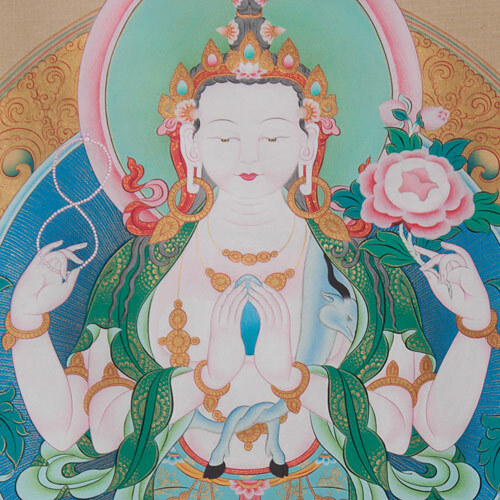 We will set the room up with a beautiful shrine, the stunning Chenrezik thangka from Bristol Sakya Centre, Tibetan carpets and cushions, which will all go to create an inspiring practice space. There is a large living room full of sofas where we can relax in breaks between sessions with self-service tea/coffee available all day/evening, a dining area where delicious vegetarian food is served three times a day, and all this is surrounded by open countryside with the River Wye close by. All kinds of special diets can be catered for here. You can see pictures of the 2018 retreat here: Chenrezik Retreat Nov 18. We will follow the sadhana called “The Benefit of Beings that Pervades Space: The Meditation Recitation of the Great Compassionate One“ by Tangtong Gyalpo, the sadhana which is widely practiced at our Dechen Centres. The weekend will start on the Friday with arrival time any time after 4pm and dinner at 7pm, and will end on the Sunday after the third session at 3pm. Breakfast is self-service available before 9am, lunch is served at 1pm and dinner at 7pm. Cost: £170. £70 deposit is payable now, and the balance of £100 to be paid by 31st October 2019. Booking information: To book and pay your £70 deposit please scroll down. Accommodation: The bedrooms are large and spacious all with views. There are 5 twin rooms so book early if you’d like one of these. Other rooms have 4 or 5 beds sharing and are very spacious with great views. Please email your request if you’d like a twin or smaller room. 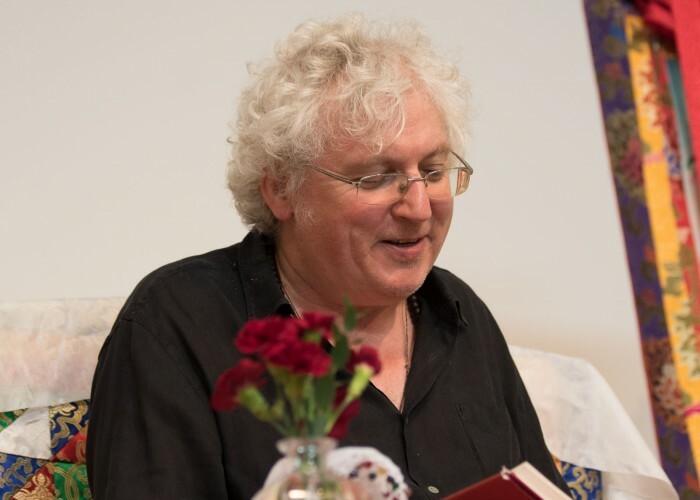 Please note: The retreat is only open to Dechen sangha members who have taken refuge and received a Chenrezik initiation and/or the reading transmission (lung) of this practice from Lama Jampa Thaye. This is the deposit required to book a place on the retreat. The balance of (tbc) will be invoiced by email about 1 month before the event.